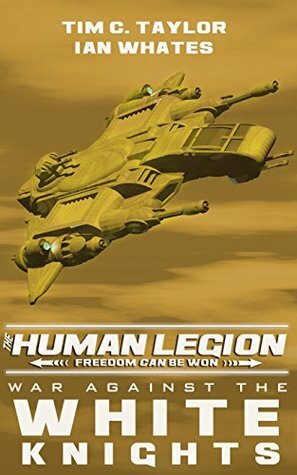 Few Reasons To Continue Forward With The Human Legion "War Against the White Knights (The Human Legion Book 5), limps along, barely running on fumes. The few reasons that gave the series some appeal at its inception, are barely utilized. Interesting secondary characters (some alien races, some humans, sentient AI's) are given short shift by the authors. Instead, the immature, self pitying, overgrown teenager, "Arun," continues to be the focal point. Contrived, and often inconsistent, contradictory plot lines and plot devices, spin off aimlessly, making the overall storylines drivel.Book 5 is not recommended and was fully read via Kindle Unlimited. Light Read Gone HeavyEnjoyed series up until this one. I considered the series, as a whole, light reading -- space operaish, with a hunk of military thrown in. Throw in some chuckles and good to go.Then came this episode which really should be a 2. Hard to follow through out, characters -- species and their uniqueness. The use of the word 'human' got confusing, at least to me. Authors should use something to identify earth humans or something. Got a little frustrated with it all.What I liked before was a story that was reasonably easy to follow and this was hard, really had to work to understand what was going on. Especially true of the battle scenes, parts where I just gave up and skimmed. Bad enough with characters but then all the nonsense of void, dimension, time, special weapons. Argh! Fighting, tactics, strategy shouldn't be hard to follow but it became nonsensical to me.I may get last book for one reason and one only. The way this one ended certainly left me intrigued but not looking forward to next if authors continue outlandish combat. And find an easy way to figure out earthlings. Great storyI've really enjoyed the first five books and look forward to number six. Character development has been good. Editing and proofing is excellent. Thanks to the author for sharing his imagination and writing skills.